BLS data show that Illinois had a net loss of 354,000 adults over the last decade from its prime working-age adult population (ages 25 to 54), with 290,000 of that loss attributable to migration rather than mortality. This is a troubling sign that indicates a weak economy – and the loss of adult taxpayers and their children. Out-migration is a serious problem for Illinois, and policymakers should focus on curtailing it by fostering a better climate for job creation and economic growth. The more Illinoisans leave, the fewer there are left to shoulder the burden of Illinois’ tremendous debts. The sheer number of residents leaving Illinois matters – but it’s also critical to understand the demographic breakdown of those out-migrating Illinoisans. When it comes to who’s heading out of Illinois, the largest group of out-migrants is people who are in their prime working years, ages 25 to 54. This is a troubling trend, which points to a weak state economy and the loss of adult taxpayers along with their children. According to data from the Bureau of Labor Statistics, or BLS, Illinois’ out-migration appears in large part to be composed of prime working-age adults. On the other hand, neighboring Indiana does not appear to be losing prime working-age adults. Illinois has lost 310,000 people due to net migration over the last decade, according to U.S. Census Bureau migration records from July 2005 to July 2015. 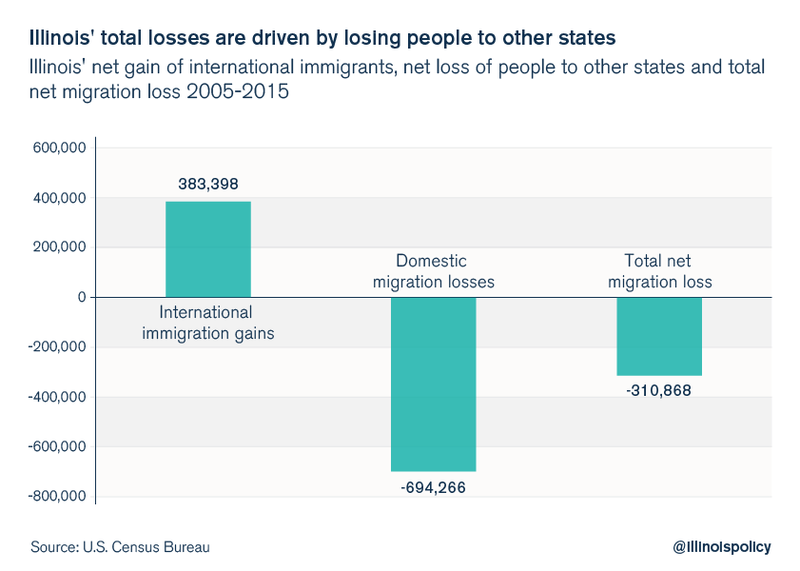 This loss is made up of Illinois’ significant net population losses to other states (-690,000), which are partially offset by international immigration gains (+380,000). Like all states, Illinois experiences net gains from international immigration. However, Illinois’ population loss to other states runs at one of the highest rates in the U.S. The Census Bureau migration data provide aggregate totals of domestic migration and international immigration each year for each state. In order to understand who is leaving and why, it is necessary to examine closely the age cohorts of people who are leaving. This can be done by considering the population of a given age group of Illinoisans in 2005, and then looking at the same population group again in 2015 after they’ve aged 10 years. For example, BLS data show Illinois had 1.75 million adults in the 25-34 age cohort in the year 2005. Looking forward to 2015, these 1.75 million 25-34-year-olds should make up the entire age group of the 35-44 age bracket. Assuming nothing changes on the migration front, by the year 2015 Illinois would have 1.73 million adults in the 35-44 age bracket after the 25-34 age cohort has aged a decade. The slight decrease in population is based on the mortality assumption of 16,400 deaths from this age cohort using Centers for Disease Control and Prevention mortality data. Only net gains or losses from migration would make this number move from the expected 1.73 million. The BLS data for Illinois’ 25-34-year-old age cohort from 2005 reveal that only 1.53 million of them remained in Illinois by 2015. That means that Illinois lost 216,000 adults from this prime working-age cohort between 2005 and 2015, with the majority of that population loss attributable to migration. The same pattern appears true of the other age cohorts that make up Illinois’ current prime working-age population. Over the past decade, Illinois lost a net of 12,000 people from its current 25-34-year-old age cohort, 216,000 from its current 35-44-year-old age cohort, and 126,000 from its current 45-54-year-old age cohort. All told, BLS data show Illinois had a net loss of 354,000 adults over the last decade from its current prime working-age adult population (ages 25 to 54), with 290,000 of that loss attributable to migration rather than mortality. What’s so surprising about this estimated loss from the working-age adult population is the fact that Illinois gained 380,000 people from international immigration in the same time period. Presumably, much of those international immigration gains should be concentrated in the prime working-age population. So even though Illinois, like all states, gained a significant number of prime working-age adults from international immigration, Illinois still saw a significant net decline in the number of prime working-age adults. Illinois’ results can be compared with those of Indiana for the same years. Indiana appears to have experienced a solid gain in the current 25-34-year-old age cohort and marginal losses from the 35-44 and 45-54 age groups between 2005 and 2015. Overall, the BLS estimates indicate that Indiana had a small amount of migration gains in its current 25-54-year-old population over the 2005-2015 period. Indiana doesn’t gain nearly as many people from international immigration as does Illinois. Indiana has only gained 93,000 people from international immigration over the last decade, compared with Illinois’ gain of 380,000 internationals, according to census data. So while Illinois, and the Chicago area in particular, clearly still draws more international immigrants than Indiana does, the Hoosier State still does much better on overall migration because it has an economy that can grow enough jobs to keep Hoosiers in Indiana.Taken together, the age cohorts that make up Indiana’s current prime working-age population (ages 25 to 54) had a net population decline of 22,000 people over the last decade. This comes against an expected loss of 34,000 people due to deaths. Thus, Indiana appears to have experienced a small net inflow of working-age adults, according to BLS data. Census Bureau data provide overall migration counts and show Illinois’ net outbound rate to other states is the highest ever at one person every five minutes. BLS estimates show that from 2005 to 2015, Illinois has experienced a net loss of 290,000 prime working-age adults. Enriched Internal Revenue Service migration data from 2011 to 2013 also show Illinois’ biggest population losses come from the three prime working-age categories. What does all this mean? Illinois cannot fix its out-migration problem until it fixes its jobs problem. People are leaving Illinois in the heart of their working years, not only when it comes time for retirement. Illinoisans need to be able to find well-paying jobs in the local economy. Until they can, Illinois will continue to lose its taxpaying population to other states.